Second Twin by Jaime Lee Mann is now available! Bestselling middle-grade fantasy author Jaime Lee Mann started writing down the bedtime stories she told her daughters when she realized they couldn’t get enough of the tales. 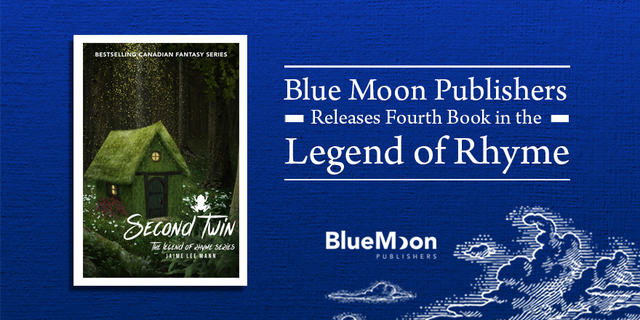 Now we are proud to be releasing the fourth title in the beloved “Legend of Rhyme” series, Second Twin. This magical tale full of mermaids and goblins, pixies and witches, and several special sets of twins is already enthralling advance readers and reviewers both young and adult. Second Twin picks up right where the prior instalment, Teagan of Tomorrow, left off. Grimblerod has led twins Asher and Ariana Caine back to ancient Rhyme. Though the Kingdom of Falmoor is rich with magic, the twins are unable to use their powers. They don’t know whom to trust, where to turn, or how to avoid doing something in the past that may alter the future forever. Meanwhile, young Teagan Rogers must decide if she is ready to leave behind everything and everyone she knows to follow her mysterious destiny beneath the waves. Second Twin was inspired by Mann’s desire to give her readers a look inside the mind of her villain and provide some insight into what events may have transpired to make that character end up the way they did. To fully enjoy the “Legend of Rhyme” series, Jaime Lee encourages new readers to begin with the first book in the series, Elora of Stone, before moving on to Into Coraira and Teagan of Tomorrow. The “Legend of Rhyme” series can be purchased on Amazon or in local Prince Edward Island bookstores. When Jaime Lee Mann was nine years old, she decided that she would be an author when she grew up. Many years later, Jaime Lee’s children would beg her to tell them stories at bedtime. Sometimes her stories were silly and sometimes they were magical. The girls loved one of her magical stories so much that Jaime Lee decided to write it down. That story would eventually become Elora of Stone, the first novel in the “Legend of Rhyme” series. JL (as her family calls her) lives in a pretty house in Prince Edward Island with her husband and two daughters (who are still little girls for now). She writes every day and plans to do so for as long as people love to read her words. Which is your favourite book in the Legend of Rhyme? Are you excited to read Second Twin?